Which Schools Have the Best MBA Programs in Asia? 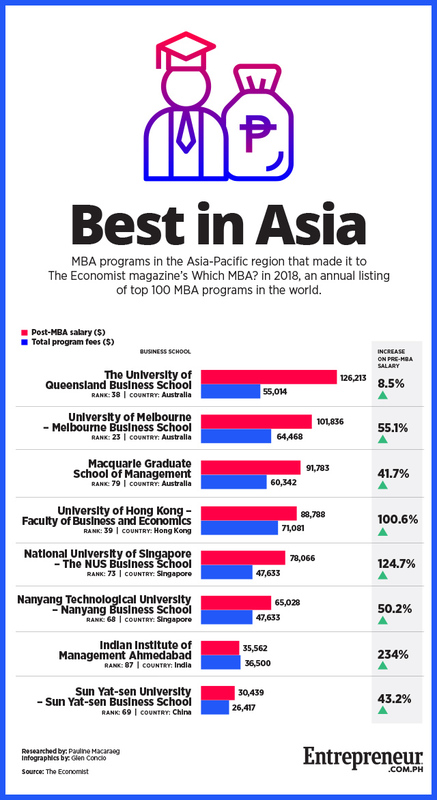 Only eight schools located in the Asia and Australasia region offering Masters in Business Administration (MBA) programs made it to The Economist magazine’s “Which MBA?,” a list of the world’s top 100 business graduate programs. Out of the eight, only Singapore’s Nanyang Business School of the Nanyang Technological University and The NUS Business School of the National University of Singapore came from Southeast Asia. They ranked 68th and 73rd in the list, respectively. Three schools are located in Australia, with University of Melbourne’s Melbourne Business School leading the Asia-Pacific list, coming in at No. 23. The University of Queensland Business School follows at rank 38, while the Macquarie Graduate School of Management ranks 79th. However, alumni of the Indian Institute of Management Ahmedabad enjoy the highest average increase on pre-MBA salary at 234 percent. They are followed by National University of Singapore – The NUS Business School alumni at 124.7 percent and University of Hong Kong – Faculty of Business and Economics at 100.6 percent. The latter has the highest program fee cost among all Asian and Australasian universities in the list. “Which MBA?” was prepared by the London-based magazine through a survey of thousands of MBA students all over the world. It used four main metrics in their evaluation: new career opportunities (35 percent), personal development or educational experience (35 percent), increase in salary (20 percent) and potential to network (10 percent). The Economist has been releasing the rankings since 2011. This year’s top three schools are University of Chicago Booth School of Business, Northwestern University’s Kellogg School of Management and the Harvard Business School.